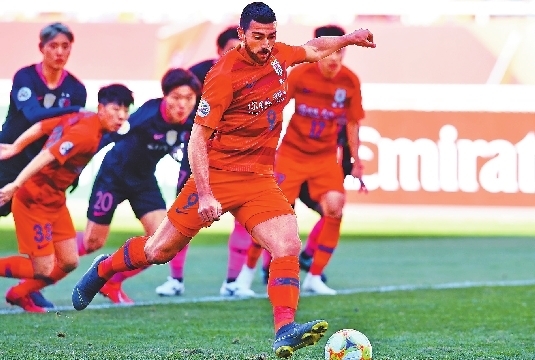 FORMER Italy striker Graziano Pelle struck twice to earn Marouane Fellaini’s Shandong Luneng a 2-2 draw with holder Kashima Antlers in the AFC Champions League (ACL) on Tuesday. Former Manchester United star Fellaini had a quiet game in midfield for the hosts, who had Pelle — another Premier League import — to thank for rescuing a point. It was the 33-year-old Pelle’s second brace in as many Champions League matches, having scored twice at South Korea’s Gyeongnam FC last week. J-League side Kashima had looked set to run away with it, forward Sho Ito twice finishing slick team moves in the 10th and 14th minutes to stun Shandong. But the imposing Pelle, who joined the Chinese Super League side from Southampton for about US$17 million in July 2016, single-handedly dragged Shandong back into the match. He buried the penalty on 20 minutes after Kento Misao handled in the box, and then arrowed the ball into the top corner four minutes before the break on a half-volley. The entertaining stalemate leaves Kashima top of Group E with four points from two games. Shandong is second with two points after successive 2-2 draws. Meanwhile, Brazilian striker Edgar scored a first half double as newcomer Daegu FC stunned two-time former winner Guangzhou Evergrande 3-1. Edgar’s brace sent Daegu on its way before China’s Evergrande, Asian champion in 2013 and 2015, threatened a comeback when Anderson Talisca pulled one back eight minutes after halftime. But Kim Dae-won maintained the South Korean side’s 100 percent start in Group F when he rifled home their third goal from a tight angle with nine minutes to go. It was the first group-stage defeat in nearly three years for Evergrande, coached by Italian World Cup great Fabio Cannavaro, who also lost their seven-year grip on the Chinese Super League title last season. Elsewhere, Keisuke Honda’s second-half strike couldn’t prevent Melbourne Victory going down 2-1 to Sanfrecce Hiroshima for their second straight defeat.